Blueberry has helped develop an A&E Patient Monitoring System, called Klok, for the East and North Hertfordshire NHS Trust which is being recommended by the Trust for supply to other A&E departments in the UK. The Klok system consists of an electronic whiteboard to manage the patient traffic in A&E Departments to ensure compliance with the national target to treat, discharge, transfer or admit patients within four hours of arrival. The Klok system displays a visual record of patient activity in real time, instantly showing A&E staff who needs attention, what tests have been ordered, results obtained, where to act to prevent breeches to waiting times, where bottlenecks may be forming, and the allocation of a doctor or clinician to a patient, together with their accompanying medical notes. Because bed managers have access to the Klok system, the process of requesting and allocating beds becomes much more efficient. All the information needed by A&E staff to make decisions is clearly and simply laid out, allowing real-time observation and intervention. The patient tracking information (which can be displayed on a wall-mounted VDU screen, on satellite PCs, or used by PDAs and other mobile devices) links to the hospital’s Patient Administration System (PAS). An interface to the Patients Administration System (PAS). This interface can accept data from the PAS and automatically stores it in the Klok patient database. A Klok patient database. Patient details from the PAS are stored in this database along with subsequent comments and modifications by the A&E staff. An interface for A&E staff via a website. A “Whiteboard” display which shows all the patients in the department along with details such as name, time arrived, doctor etc. A colour coded display is used so that staff can quickly identify how long each patient has been waiting and if a breach is likely. A “Desktop” display which is used to edit patient details and to transfer patients between areas within the A&E department. A “Medical Records” feature which is used to automate the requests for patients’ medical details. Administration screens which are used to define system parameters such as doctors’ names, department names, user logins etc. 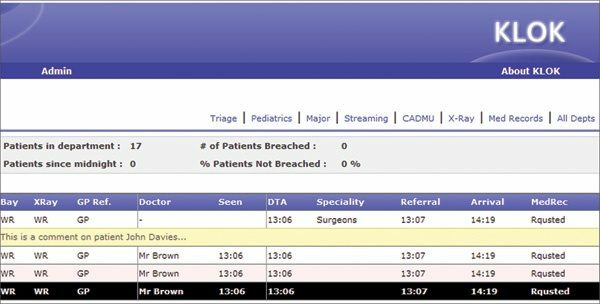 A reports area which allows a user to generate reports on the number of patients who exceeded the 4 hour wait time, plus a summary of the doctor’s workload. Klok has already helped the East and North Hertfordshire NHS Trust to substantially reduce the number of breaches in two of its three busy hospitals – Hertford County in Hertford and the Lister in Stevenage – with installation at the Queen Elizabeth II in Welwyn Garden City to follow. If you would like to see Klok in action, the Trust is happy to show interested parties the live system. Alternatively, Blueberry also has a test system online, which can be accessed via a login (provided on request).